Are you having friends and family over this weekend and still aren't sure what to serve them for dessert? We've got you covered with this wonderfully smooth recipe that will please everyone, no exceptions! Enjoy three delicious and creamy mouthwatering layers of pure delight! Preheat the oven to 450 degrees F and place the pie crust on a 9-inch pie plate. Bake for 10 minutes, then cool. In a large bowl, whisk cream cheese, powdered sugar and coconut extract until creamy. Add 2/3 cup of Cool Whip and whisk again. Stir in 1 cup of coconut and spread evenly in the crust. In a second bowl, whisk the mixture of milk and pudding. Refrigerate for 3 to 5 minutes. Gently spread onto the coconut filling and garnish with remaining Cool Whip. Evenly spread the remaining coconut on a baking sheet. Bake at 350 degrees F for 4 to 5 minutes, stirring every minute. 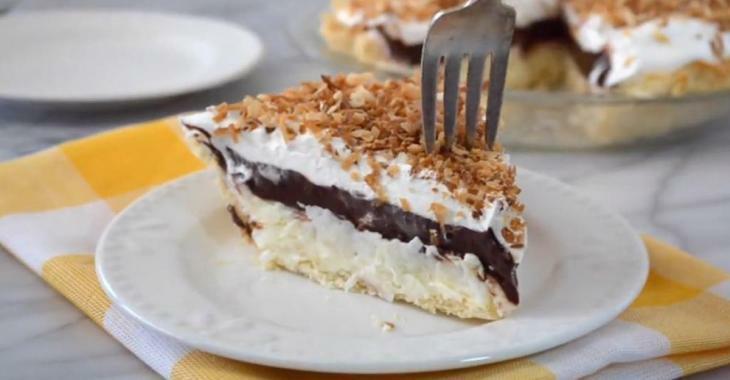 Cool and add the coconut on top of the pie. Store the pie in the refrigerator in an airtight container. The following video shows you the detailed steps so you too can create this sublime dessert that will please all your guests and win you a ton of compliments. A guaranteed success! Do you like our recipes? Would you like to follow us? Don't wait any longer and subscribe to our Pinterest page to discover our many recipes and be able to easily save them on your personal boards.